Royal Caribbean Vice President Commercial & New Business Development, John Tercek, spoke at a recent tourism conference in Greece where he advocated the country invest in its ports to win over more cruise business. 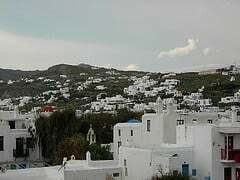 The growing demand for cruise ships forces companies to order bigger ships so if Greece wants to get its share of the cruise business, it must modernize its ports and expand other ports in the coming years. In Tercek's speech, he indicated the Greek cruise destinations that can best attract the interest of cruise companies are Piraeus, Santorini, Heraklion, Chania, Corfu and Katakolon, but others, such as Rhodes and Mykonos need more modern infrastructure to support the growing demaind. Global competition for cruise ships is on the rise and Tercek noted that Australia's cruise tourism has increased by 77% over the last 10 years and that demand is still increasing. 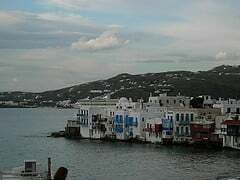 Greece will close 2014 with about 2.5 million cruise visitors but that is still less than Italy and Spain. Tercek believes the big disadvantage for Greece is most cruises do not home port from there. Last year only 212,000 passengers departed from Greek ports whereas 2 million left from Italy. Royal Caribbean's Legend of the Seas sailed into the port of Souda, which is on the island of Crete and marks the first time Legend of the Seas visited the port. The meeting was also attended by the President of the Port Authority of Chania, Costas Brokalakis and the shipping agent, Nicholas Tsagkarakis. 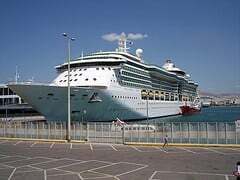 A meeting at the Ministry of Culture and Tourism in Athens on Thursday will lay out a plan by Royal Caribbean to spend over 25 million euros to build a pier at Akantia where they can accommodate ships of up to 350 meters and turn the island into a small "cruise center". Greece has been hampered by bad economic news for months now, but Royal Caribbean is doing its part to help the nation out a little. Royal Caribbean announced it will invest in the port of Heraklion by spending money on port infrastructure upgrades, construction of a hotel and a conference center. Royal Caribbean's strategy in Greece is to target six ports: Piraeus, Heraklion, Thessaloniki, Rhodes, Kos and Mykonos. The plan is to transform one of these ports into a cruise hub, which will bring in thousands of visitors each day. Currently, Heraklion and Rhodes are the leading candidates for that distinction. The plan includes port infrastructure and construction of a 4-star hotel, a conference center of 1,000 square meters, a shopping centre of 3,000 suare meters and a marina for 120 yachts. Royal Caribbean estimates over a 5-year span that 800,000 passengers per year could visit Heraklion, which would bring an annual revenue of over €3 million. Royal Caribbean was forced to cancel stops at Piraeus, Greece (Piraeus is the cruise port that serves Athens) yesterday and today because striking taxi drivers blockaded the port, preventing passengers from getting to their tours. The good news is the strike is due to end at 5am tomorrow, in time to allow Splendour of the Seas and Navigator of the Seas to dock. Greece has been meeting with Royal Caribbean as part of the Posidonia Sea Tourism Forum that took place this week but represenatives from the country recongize the fact more work is needed to be done before it can be ready for likes of Royal Caribbean. The aim of the visit of top executives of Royal Caribbeanto Greecce is to explore possibilities for further development of the company in Greek cruise market. In order to promote cruise tourism throughout Greece, the Deputy Minister of Culture and Tourism George Nikitiadis accompanied Royal Caribbean Vice President John Tercek on visits to the ports of Thessalonica, Kos and Rhodes. Rhodes has all conditions for emerging as one of the major cruise destinations, however, "still wants a lot of work". The process of fast-tracking is the conclusion extracted from what was said yesterday evening, during the press conference given at the Municipality of Rhodes. 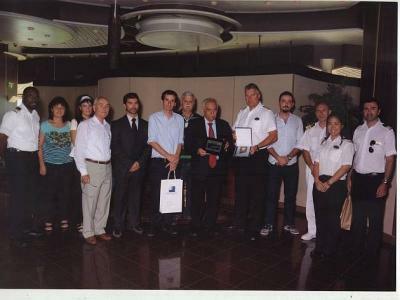 Tercek traveled with Nikitiadis to tourist destinations across the country and visited the port facilities there as well as has meetings with local actors. During their visit, then, in Rhodes and Kos, they had the opportunity to see the situation of port facilities and areas of potential cruise passenger visits and discussed issues critical to the development of ports in a way that creates perfect conditions for the reception of cruise ships and increased traffic. Some positive impressions seemed to be made on the Royal Caribbean executives, who said yesterday, from Rhodes that "it is a beautiful island, is a rapidly growing island is a popular tourist island" Asked also Mr. Tercek if Rhodes can easily be home-port, he replied that: "Not easy but possible", while Mr Nikitiadis added that "wants a lot of work." Nikitiadis' deputy also commented on the possibilities, "I think the cruise market is a great challenge. The government is committed to proceed with very important measures and believe that even the prospect of creating the municipalities in the region, with any carrier, new facilities. This will be subject to procedures of fast-track. Such a process will reach all sides of the market, which will ensure that we have more people, more and more ships, more and more visitors all year long. " He added, "I must point out that one of the major issues of concern throughout the whole country... is to ensure greater security, which must serve the visitor and not to harass them. This happens in most our ports. It matters that we discuss with them the cruise line, because they know much better since they go around the world and they know what they receive complaints aboutd. So, this cooperation is the relationship developed and we believe that, in future, strengthens more and more, is for the good of the island, for the good of the marine tourism is good for the cruise and hope in the future to go too much better. " Investments for the development of the Zakynthos, Greece harbor will be addressed at a special meeting, which will take place this afternoon at the office of Mayor of Zakynthos Stelios Boziki. The initiative for the idea is from naval architect Dimitris Caper. Present at the meeting will be John Tercek, Senior Vice President of Royal Caribbean, Demi Karapatakis, Director of Royal Caribbean, Andrea Stylianopoulos, President of Navigator Tours, MP Dimitris Varvarigos, Antiperifereiarchi Dionysis Mylonas, Harbour Master John Stathis, President of the Port Fund Dionysis Kardiani, and the President of the Chamber of Costa Kapodistrias. Mr. Tercek and Ms. Stylianopoulos are visiting the island of Zakynthos at the invitation of Mr. Capers to explore whether to invest capital to build the port infrastructure that is necessary to accommodate cruise ships in Zakynthos. The master plan by Mr. Capers for the development of Zakynthos por has received favorable comments from both the municipality and the Ministry of Tourism. Royal Caribbean also met with officials from Thessalonica, Greece yesterday about bringing Royal Caribbean ships to their port as well. The challenge of visibility and awareness is required to win over Royal Caribbean if it was to return to Thessalonica, Greece. Royal Caribbean Vice President John Tersek was visiting Thessalonica today and spoke to local officialls about the possibilities of the port as a cruise destination. Royal Caribbean is considering giving Thessalonica a second chance and returning after the departure of Navigator of the Seas from the city a few years ago. Back then, Navigator of the Seas had only made half of her stops to Thessalonica in order to avoid extensive paperwork due to local port authority regulations. "I see that Thessalonica is very well placed, but the condition is becoming a recognizable tourist destination, so first priority should be to promote the tourism of the location," said Mr. Tersek during press conference. Mr. Tersek declined to say when if Royal Caribbean intends to bring cruise ships back to Thessalonica, noting simply that Royal Caribbean has completed the itineraries until 2012. "Any change will take place after 2013" he stated. The new mayor of Thessalonica knows that the city must do more to entice Royal Caribbean to retun, "Depends on us whether it's Royal Caribbean Cruises. We are confident that any cruise ship come in Thessalonica will not want to leave," he said, while noting that the port has more than sufficient infrastructure for any size ship.